It’s fun to have a pool in your backyard, but there’s a not so fun part of pool ownership: maintenance and repairs. These can include pool cleaning and chemicals, repairs, and heating. And while they’re not the best part of owning a pool, they are necessary — and sometimes expensive. Proper maintenance of a pool will typically cost about $259 annually, or between $135 and $383. This includes heating, cleaning, and chemical testing. Regular maintenance is essential to keeping your pool running effectively for years to come. Of course, maintenance is the easy part. Pool repairs can be more complicated and will usually be more expensive. Repairs can range from $100 for simple fixes to $1,500 for more complex problems. Most home owners will spend just over $500 to repair a pool. Pools often have extensive equipment including filters, pumps, heaters, and liners, but the problems with pools are often predictable and straightforward. Most pool owners should be on watch for heater, liner, and leak repairs, as these are the most prevalent and can be expensive. 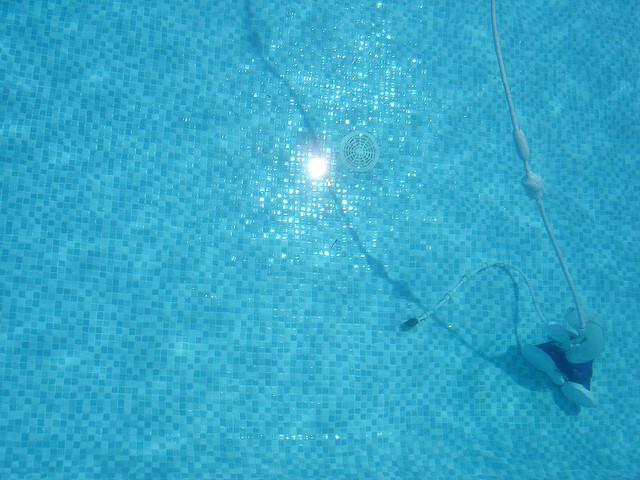 One of the most common pool repairs, pool heaters are also one of the most complex pieces of equipment for your pool. Much like a home heating system, your pool’s heater requires maintenance, checkups, and sometimes expensive repairs. Most pool heater repairs will cost about $383, or between $167 and $600. Large heaters and saltwater pools, or heaters that haven’t been maintained, may cost more to fix. Another common pool repair, pool liners can be subject to use and abuse and occasionally require patching or replacement. This often happens due to rough playing in the pool, or even use by family pets. Repairs can range from $20 for a DIY vinyl liner patch kit to $300 for a professional fiberglass repair. Pool leaks are often found after owners notice that their water levels are rapidly declining. Leaks can be in the plumbing or the pool itself — and most of the battle is simply diagnosing and finding out where exactly the leak is coming from. Leaks are usually not obvious unless they’re coming from external plumbing, and may require a professional to dive into the pool with dye. Most pool leak repairs will cost about $350 if you need help from a professional. Pool repairs can be expensive, and may sometimes exceed the cost of a home warranty with pool coverage. While a home warranty can be a few hundred dollars, your pool repair may be $500 or more. With a home warranty, your pool — and other important home systems and appliances — are covered for repair and replacement, often saving you money on the cost of common pool repairs. Of course, remember that in order to take advantage of your pool repair warranty coverage, you’ll need to carefully maintain your pool. This includes regular cleaning, chemical testing and balancing, filter cleaning, and more. Consult your pool manufacturer’s guide to find out how you’ll need to maintain your pool for optimal performance and warranty coverage. Pool maintenance and repairs aren’t the best part of owning a pool, but taking care of them is necessary if you’d like to enjoy your pool for years to come. Be sure to take care of essential maintenance and repairs today to ensure that your pool stays in good working order.